I'm working on a travel essay about Singapore this week, which prompted me to ask friends where they like to bring their guests from overseas to sightsee (or perhaps "look see, look see" is the more appropriate verb). I wasn't thinking necessarily of places totally off-the-beaten-track, like the dragon kiln off Jalan Bahar or the ruined Shinto shrine I've yet to visit in the MacRitchie Reservoir jungle. More like places that provide a nutshell experience of the "real" Singapore (inasmuch as that term can be meaningful). One friend suggested drives past the HDB landscape and several people specifically mentioned Tiong Bahru (which makes me think there's a separate essay I could write about that notion of an idealised, "real" Singapore). Mustafa came up several times too and it's a perennial favourite of mine anyway. No one said Orchard Road, of course. Not that I'm fishing around for specific places to name-drop, by the way. My essay is more about feelings and vibes, so I'm talking to people to get stimuli more than anything. If you live in Singapore, what would you like to show (maybe even show off) to a foreign visitor? This is a question that's really close to my heart- I asked a version of this to the children in my dissertation study and invariably, they almost always said something touristy like Sentosa or the Esplanade, which tells you something about what primary school kids think of when they think of what "real" Singapore is like. Personally, I like Katong, even though it's not really representative of the larger country I suppose (although what is?) Maybe I'm biased because I grew up in the area so it'll always be a very Singaporean thing for me. Little India is probably the least "touristified" of the ethnic enclaves (compared to Chinatown and Kampong Glam). Or maybe Geylang Serai. I brought one our friends who was visiting from Michigan to Tekka Market and the spice shops around Little India and she seemed to really like it. The small streets off Bugis / Bencoolen Street area, like Liang Seah (where I have weekly yoga classes). Off the busy main roads, lots of independently-run shops and restaurants all on one street, and if it gets too warm, you can dive into one of the kopitiams for a drink. I would definitely take my visitor to Fortune Centre for its huge gathering of vegetarian restaurants followed by a stroll to the National Library, taking detours along the way. Thanks for the most excellent suggestions! I have a soft spot for some of these neighbourhoods too, but you guys have some great ideas about how to weave them together for walking tours. East Coast evening... bike, check out the food options and cable skiiers before plunging into the hawker centre or adjacent seafood place. Arab street, liang seah street area are also great haunts cos you can take them for a "look see" at the malls or streets/sights nearby before adjourning for a quieter evening there. Labrador Park at night. Sitting on the jetty, hearing the waves lapping, feeling the night breeze, smelling the sea salt, basking in the warm glow of off shore refineries. Cool, thanks. 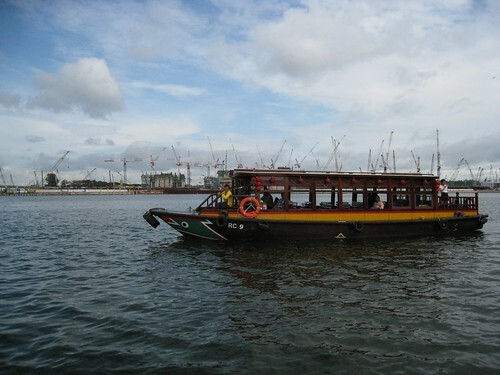 I haven't been to Labrador Park at all --- must check it out some time.